Director Rian Johnson is exactly what movies need. Perhaps the best way to break Hollywood out of cliche land is to play into the most typical of genre conventions and then turn them completely on their heads. “Looper” must be the work of someone who doesn’t finish until every little detail is drawn out, and every possible subplot comes full circle. There’s a lot to get through and a lot to sort out, but the fact that the ending pulls it off in an unpredictable way makes it work all the better. 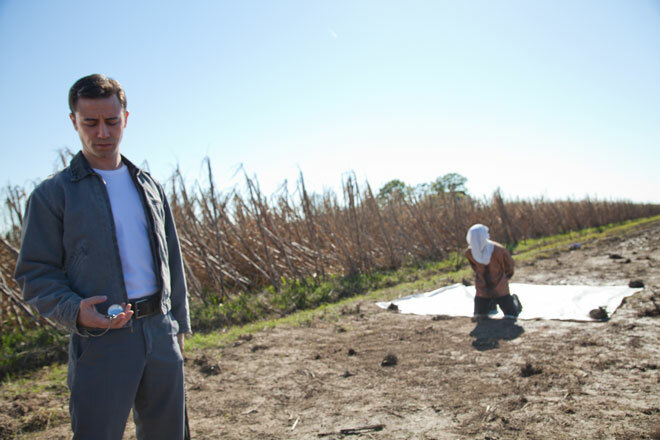 “Looper” might be the first rurban (rural and urban) futuristic dystopia I’ve seen on film. It is not set in New York, Los Angeles, or Washington, but rather an unnamed metropolis and its outskirts in Kansas. It also occupies many different times in the future. 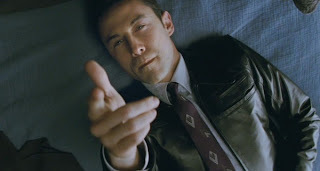 Joe (Joseph Gordon-Levitt) is a Looper. In the future, time travel is discovered and very illegal. The mob sends people from the future into the past and it is the job of the Looper to kill them and dispose of the body. Basically, the Looper stands in the field and waits for the body to be zapped to them. However, there’s a twist to being a Looper: your job doesn’t last long. Because of how illegal time travel is in the future, a Looper must kill their own future self at some point. After doing this, they get a big payday and get to live happily off of it for 30 years until they are kidnapped and brought back into the past. This process is called “closing the loop.” I’m always a sucker for creative wordplay. I like films which hinge their character’s personalities on their careers, and only a certain kind of person is fit to be a Looper. A Looper must act on the fly, never hesitate, and be prepared to die. You can see this in how Joe shoots every person that is zapped to him without even thinking. However, when his future self (Bruce Willis) is zapped to him, he hesitates. It doesn’t feel like one of those inexplicable movie moments when you wonder “why would he hesitate now?”. On the contrary, it feels very human, as if no one can know what death is like until they actually face it. Yet, despite an expiration date, Loopers never lose their free will. One Looper (Paul Dano) lets his older self go. Meanwhile, young Joe has no control over the reckless and unruly older Joe; his future self escapes into Young Joe’s present. While hunting down future Joe and attempting to close his own loop, many other loops are opened, and historical events are altered. “Looper” establishes from the very beginning that time travel is possible and because of that, it never tries to explain it. A story that tries to explain time travel can have difficulty working. Time travel involves many disciplines (philosophy, physics, etc.) that I have only limited knowledge of. Watching a film explain it is like being in a complicated lecture with a professor who won’t explain his notes. 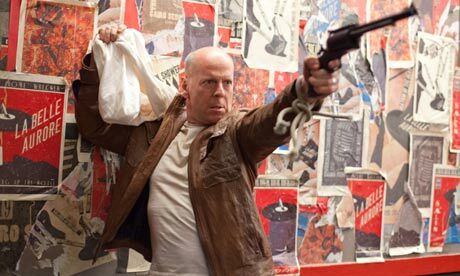 “Looper” is not about how time travel came about, but rather what potential consequences it can have. Keep that in mind when you see “Looper.” Some of the time-altering sequences threw me off guard at first, but just keep in mind that the most accomplished part of the film is that it assumes that the audience is smart enough to at least try and figure it out on its own. Now that you know that there’s more to “Looper” than untangling mysteries, you can appreciate the immense detail put into this world. I believe this is in part what will make it so memorable. Even the guns that the Loopers use (blunderbusses) are instrumental to the story. In this future, China is the new world leader. This splicing in of timeliness made some people in the audience chuckle, but it made me think of “Blade Runner” creating a future that was heavily influenced by Japan, which was world leader at the time. Like “Blade Runner,” “Looper” can be seen as a reflection not just of how we feel the future will be, but how we feel the present is. Of course, much has been said about Joseph Gordon-Levitt’s physical transformation into a younger Bruce Willis. This is a great feat for the makeup department. However, Gordon-Levitt pulls it off by actually morphing himself into Willis. Apparently, he only watched recent movies that Willis starred in to prepare for the role. That way, he could understand what Willis would become, as opposed to only who he used to be. It is kind of an amazing to see two actors play the exact same person sitting in a room together. Watching old and young Joe trying to piece memories together past and present over steak and eggs in a diner is hands-down one of my favorite scenes of any film this year. It is so well directed and written that it ends up being intriguing and even funny all at once. Then, Johnson makes an unusual choice for a film like this. Instead of speeding it up and constantly raising the stakes and the action, he slows it down. Joe still needs to clear his name. He seeks the notorious gangster and boss of all Loopers, who is named The Rainmaker, as a young boy, and attempts to kill him. Joe leaves the city and heads out to the country, where he finds the young boy living on a farm with his very protective mother (a nearly unrecognizable Emily Blunt). This section of the film might not be the most breathlessly exciting, but it is where it gains its emotional weight. At its heart, “Looper” is the story of what kind of person it takes to make the world a better place. Rian Johnson seems like one of those filmmakers who is so well versed in cinema. At times, the characters of “Looper” communicate as if they are in a film noir, a convention Johnson also used in “Brick.” Then, it even becomes supernatural (in a way that I will not spoil). The violence in it is not glorified, but it is certainly stylized. Part of the sick, twisted fun of being a filmmaker is discovering all of the different angles you can use to show someone getting shot in the chest. The most gloriously cinematic part of “Looper” is that pretty much everything that is brought into play at one part of the story is brought back again later on. “Looper” is a meta story because just as Joe must close his own loop, the film must payoff all of its plants and in effect, close its own loops. “Looper” takes place in the year 2044 and shows a world of hovering cars, nearly microscopic cell phones, and drugs in the form of eye drops. “Looper” is not suggesting that time travel will necessarily be discovered by the year 2044, but what it does suggest is that greed and selfishness can lead to an endless cycle of misery. And eyedrops aren’t enough to cure it. Also, forgot to mention this in my review: Jeff Daniels gives a fantastic performance as the surprisingly zen crime boss. He is currently having the career comeback that I never knew he deserved. This entry was posted in Bruce Willis, Dystopian Films, Emily Blunt, Jeff Daniels, Joseph Gordon-Levitt, Looper, Movie Review, Paul Dano, Rian Johnson, Sci-Fi, Time Travel on October 9, 2012 by ian0592. The writing and directing are in top-notch form where everything keeps you riveted and compelled, but there was that certain element of human-drama that just seemed to be missing. I don’t know where it went or why it didn’t come to me, but it just didn’t and made me feel like I was missing out on something in the end. Nice review Ian.